The J.S. Vig Project Green team audits a new construction project or existing building operation through benchmarking and careful evaluation. At the audit’s conclusion, we propose best practices derived from industry standards (LEED, Energy Star®, ISO 14000) and emerging technologies. We then simplify the expanding universe of sustainable construction and adapt it to the best 5-20 building practices that meet a project’s specific needs, using a cost/benefit approach. J.S. Vig offers these best practices to the client in a menu format – where they can select individual strategies based upon the cost/benefit analysis we provide. After the sustainable practices are implemented, the Project Green team will continue to ensure that all systems are operated and maintained optimally through measurement and verification practices. Solar energy can be used to provide electricity or heat water. Alternative roofing systems decrease heat island effect, and also filter and retain rainwater before it enters the storm water system. Wind power can be utilized to supplement energy needs, reducing carbon emissions. Native landscaping can reduce the need for irrigation and costly routine maintenance. Roofs, roads and sidewalks place large volumes of unfiltered water directly into watersheds, thus increasing pollution levels. Permeable paving systems allow water to naturally filter through the Earth’s surface. 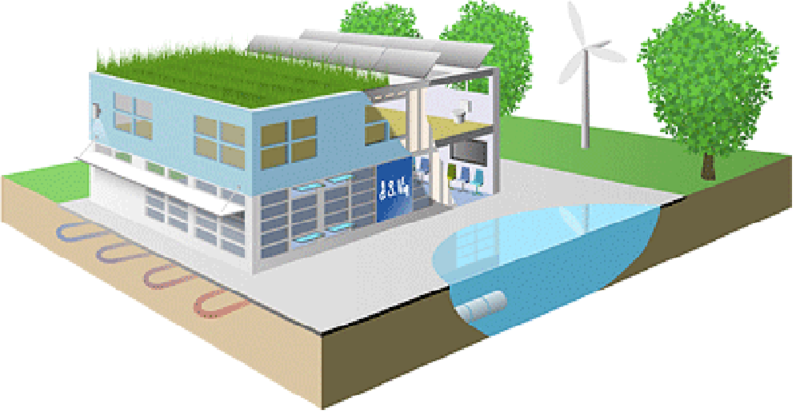 Geothermal power can be used to offset heating/cooling needs. The selected location of a building plays a role in available natural light, orientation to renewable energy sources and the use of existing buildings and urban infrastructure. Inside and out, commercial buildings can use strategies such as efficient lighting, heating and cooling, appliances and various building automation technologies to improve energy efficiency. Lighting is the 2nd largest energy use in a commercial building. Using natural daylighting methods and efficient lighting technology saves energy costs and reduces carbon emissions. Furniture places big demands on natural resources, and often contains harmful chemicals. More sustainable methods can be employed that use recycled and rapidly renewable materials, along with low off-gassing materials. Proper comfort and air quality conditions keep building occupants happy, and help improve worker productivity. The structure of a building places large demands on natural resource extraction. Different structural types will determine the outcome of cost, flexibility of building type, lifecycle and amount of recycled content. Plumbing fixtures in buildings consume a considerable amount of freshwater for necessary activities such as hand washing and toilet flushing. Advances in plumbing technology now allow for minimized freshwater use. Devices that meet Energy Star® requirements consume less energy and reduce carbon emissions.